We're helping to end hunger! 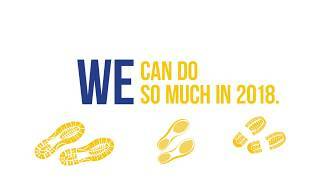 This year is our 36th consecutive year walking in the Charlotte CROP Hunger Walk. Once again my wife Sandy is walking on our behalf. This doesn't dampen my enthusiasm, I am blessed beyond measure to have such a faithful and loving wife. Because none of God's children deserve to go hungry we are committed to raise $40,000 towards the larger goal of Christ Lutheran which in turn is dedicated to make a transformational impact by loving our neighbors down the block and around the world. Please be assured your gifts will be used to make a significant impact in the lives of our neighbors. It represents a hand-up, not a hand-out. We're excited to be part of it and would love to have you join us on this journey. The steps we take - and the funds we raise - will make a real impact! 15. TTo God Alone The Glory! To God Alone the Glory. May you be richly blessed as you continue to feed the hungry in Jesus’ name. Good luck with your walk, and best wishes from the Chicago CROP Walk! In honor of Rick and Sandy who have been faithfully dedicated to this great cause.